Love Lyric and Other Poems of the Croatian Renaissance: A Bilingual Anthology is a revised and expanded edition of The Lute and the Lattice: Croatian Poetry of the 15th and 16th Centuries, first published in The Bridge (Zagreb), volume 25 (1971). The original Croatian poems have been added in order to create a bilingual edition. The earlier translations have been revised in order to reflect the Croatian originals more closely. The volume also features notes and a bibliography listing both the source works and studies pertinent to the sometimes extensive discussions in the notes. Providing also an overview of Croatian literature by way of introduction, the book is intended for the general reader interested in love lyric, which is framed here in its particular historical and literary contexts, especially since the high-quality Croatian phenomenon is much less familiar to most readers than its better-known Western European Renaissance counterparts. 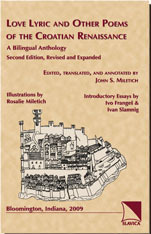 The book is also aimed at the student of Serbian and Croatian coping with the intricacies of the early language and its Renaissance conventions, the translator confronting theory and practice, and the specialist drawn to such questions as the role of Romance literatures and of the rich folk and popular traditions in the production of Croatian Renaissance lyric as well as the interpretation of individual poems.